My first review ever that turned out being rather prophetic. 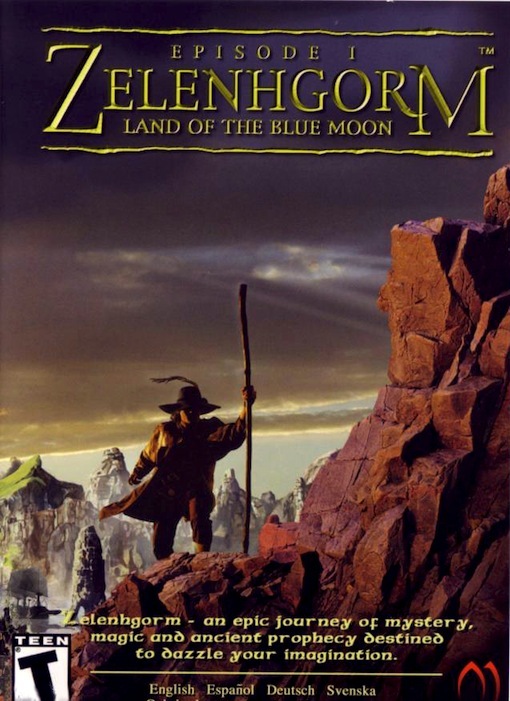 Unfortunately, Zelenhgorm, which was initially intended as a long series of games, failed miserably and was never continued (I hope it wasn’t me). In retrospective, the game had a truly unique feel to it and provided some interesting ideas – it just wasn’t a well-finished product. It was also in a way a solid return to FMV adventures, so I’m really, really sad that it didn’t work out. All I can say is: Zelenhgorm, I forgive you. First published on Just Adventure+ in December 16, 2002. But let’s start right from the beginning. Or else it might get hurt. After watching the introduction sequence, I told to myself “this seems truly interesting”. We play the role of Arrikk Vaheirr, a villager on the small island of Seneva. He is a tall guy, with long blond hair who dresses like a peasant and has fluffy eyebrows. You probably never played a character like him before. One interesting thing about Arrikk is that he is left-handed. This information might seem rather useless, but you’ll soon see why I mentioned it. The game starts with Arrikk dreaming about a ship, apparently sent by the gods, traveling a long way through immense seas and encountering people wearing funny foam-rubber dresses (yes, foam-rubber dresses) who break vases. It appears as if these people are attacking a civilization and destroying their possessions. During these flashbacks, a woman (or goddess?) tells Arrikk in a cryptic message that he “must follow the path of the water”. Then, he awakens and realizes that the ship he just dreamed of has landed next to his house. That’s what I call a nice way of starting a game: it’s weird but it definitely catches your attention. Arrikk seems to be quite a creative person since his home is filled with all kinds of gizmos that we’ll need to use over the course of the game. This is one of the reasons why the rest of the villagers don’t like him. Encounters around the neighborhood will reveal hostile feelings towards Arrikk. It turns out the villagers are very superstitious and eventually accuse him of “left-handed witchcraft”. He will be suspected through the entire game. It’s apparent that Arrikk is very different from the rest of the villagers. He seems much more intelligent than most of them. Actually, he doesn’t look like them either; while they look definitely Oriental, Arrikk’s facial features are somewhat Scandinavian. This adds even more to the mysterious atmosphere that surrounds the story. Technically speaking, Zelenhgorm is, to say the least, just fine. It doesn’t stand out in any particular area but, as a whole, it gets the job done well. The graphics are good although there are some very pixelated scenes at points in the game; it doesn’t look awful but it’s just as if some sections were in VGA. This isn’t so bad but it gives the game a dated look. Animations are very nice: you get to see a nice cutscene (luckily skippable) each time you walk with a character. Also, the interactions with many objects are nicely animated as well. Music is sparse but effective: you get a nice orchestrated tune here and there but mostly in situations of danger. The music in the introductory sequence is marvelous – it sounds inspired and truly epic as it makes you feel like something very big is about to happen. FMV hasn’t been too successful with adventures and it’s good to see a game that gets it right. The real actors is the best technical aspect. They’re perfectly integrated with the gameworld and the videos have a pretty good quality. Fortunately, they’re not overused and there’s actual gameplay. The acting is a tad corny in several cases but is bearable enough because all the characters are quite interesting except for Arrikk, who has very little personality as he speaks in a very monotonous manner. This is not good for the main character, but there’s possibly a reason for him to act and speak this way. One thing of interest is that several of the actors worked in the Star Wars movies, although none of them appear in the first episode, so don’t expect to recognize anyone yet. I had mixed feelings regarding the interface. The game is presented in a 360° panoramic view similar to that used in Cryo games such as Atlantis. The only difference is that there isn’t a fixed cursor, that is, the cursor appears on screen only if you’re looking at an object of interest. It takes a little while getting used to this but is nothing serious. All in all, the game flow is excellent (provided you do a full install) and gives you the feeling of actually being in Zelenhgorm. HEY, THAT DOES SOUND NICE! SO WHAT’S THERE TO DO IN ZELENHGORM? Sadly, not much. The game does have a feeling of being big: there’s a large market where you can buy lots of stuff, you can skin dive in the sea for pearls (the currency used in the village) and there are plenty of interesting characters to meet. You will pass the night in the stocks if you pester the guards or the townsfolk, and you may even die if you push things too far. So, while there’s plenty to do, the problem is that there aren’t many puzzles. This reminds me of games like BAT II or Dreamweb where you had an expansive world with many things to try but actually not many important things to do. However, Zelenhgorm isn’t even that big. While it’s not overly linear, and several tasks can be accomplished in no special order, one of the biggest frustrations in the game is that once you reach an important point in the story… there’s actually nothing to do there! All of this makes the game terribly short: once you know what to do, it can be solved in less than half an hour – it really is that short. There are some tricky puzzles but they’re not fair. You can miss important items because they’re not a hotspot. For example, at a given point, I knew I had to do something that was fairly obvious but didn’t even try it because the item in question didn’t have a hotspot. The idea of an episodic game is very attractive but it makes me sad to say that, as a standalone product, Zelenhgorm: The Great Ship is seriously lacking. Maybe if Moloto would have shortened the number of episodes in order to put more content into each one of them, it might have been an overall more satisfying experience. After all, there have been games over 6 discs long and, given that each episode from Zelenhgorm seem to occupy 3 discs, it could have been easily twice as long by having the content of two episodes shipped in 6 discs. By the end of the game, I had met Arrikk, explored his native village, learned a bit of history about his family and had gotten just a glimpse of his destiny. That’s when I realized that nothing had ctually happened! Now, this may work in a TV show where the first episode sets up the mood and introduces the characters, but it doesn’t fit in a game where you are supposed to buy each episode. 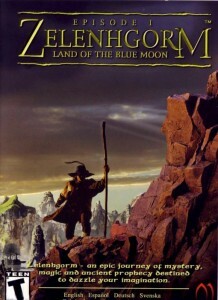 I do want to know how the story continues — I really liked it — but, frankly, if each installment of Zelenhgorm happens to have this content, I’m not sure if I want to go any further. This is sad because the initial premise was great and I loved the overall idea, but I cannot say that Zelenhgorm is a good game. It’s lacking too much and my final impression was quite a letdown. Cool, we already have spammers! It means the site is doing great. Hi! I have problem with installing this game… i don’t know what is wrong: i was installed first cd (i have originals) and then i follow instructions and copy gfx from cd2 and cd3 and replaced it and all…but the game is not started, exept the introduction sequence.. can anyone tell me what is wrong?? p.s. my graphic card is not too bad, if i can run other big games why not this one? (ako znaš hrvatski bilo bi dobro i na hrvatskom ) hvala/thanks! I’m really sorry but I’m out of ideas… It’s been ages since I installed the game but I must say that I don’t remember having to manually copy any files.